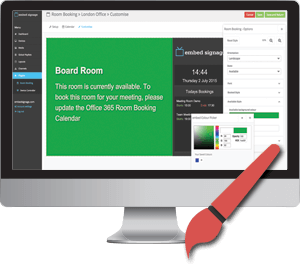 The Room Booking plugin provides users with a standalone set of features that allows the management of meeting room displays via the built in online calendar or Office 365 Outlook Calendar. 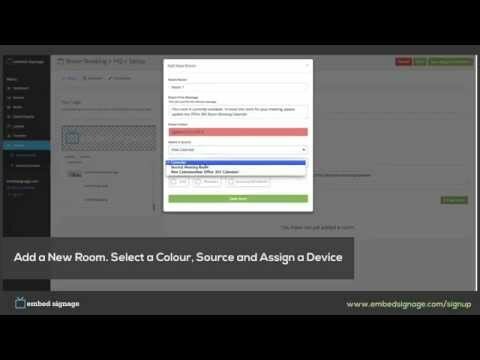 Create multiple room booking systems for different locations, add rooms and associate displays to each room. Add, edit, delete and easily customise available and booked status designs. 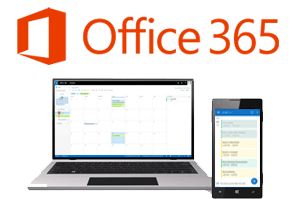 Easily and quickly integrate your Office 365 Business account with the Room Booking system to automatically update meeting room displays directly from the users’ Outlook Calendar. The automatic two way integration means you can update your Outlook Calendar via your desktop, tablet or mobile and watch as the room displays update with the latest meeting information. 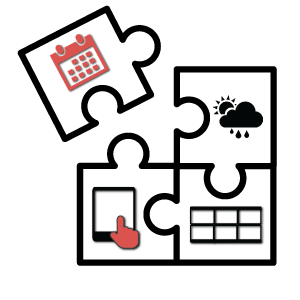 By adding meetings via the web-based built in embed signage room booking calendar, events will automatically update to the Outlook Calendar ensuring that your system is always current. Not using Office 365? No problem! 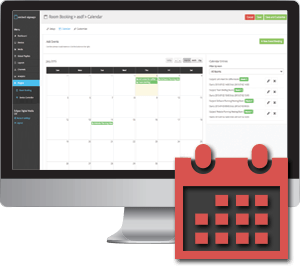 The embed signage room booking system has it’s own fully functional booking calendar allowing you to add, edit and remove events. Quickly add a new meeting by entering the desired date, time and room along with optional features such as a logo and greeting message all via the online dashboard. embed signage supports a variety of device operating systems, giving you the flexibility to choose the right meeting room display(s) for your project. Small displays such as the 10″ and 22″ Samsung Smart Signage Platform D Series displays are an ideal partner for this Room Booking system. You could also use devices like Android Tablets and iPads or any other compatible device you wish. See the full list of compatible device operating systems for embed signage here. 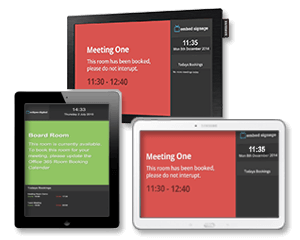 The embed signage Room Booking system provides easy to use customisation features for the meeting room display designs. Customise the look of both the Available and Booked states, in both portrait and landscape orientation. Upload your own custom fonts and logo to maintain consistent branding across your meeting rooms. Give each meeting a personal touch by adding a unique logo to the event, helping you welcome your special guests. You can also add a personal greeting message to be displayed when the display enters the booked state, helping you to highlight the agenda or specific actions you want your guests to take upon arrival. This plugin in is available to use by itself, giving you all the tools needed to run it as a room booking system and nothing else. It is also available to use within a full access embed signage account, giving you a Room Booking system as part of your overall digital signage set up. If you would like to use the embedsignage Room Booking plugin on your account, just get in touch and let us know. We’ll add it to your account for you to test out!